Today, genotype 3 infection is one of the most dangerous infections. It affects approximately 20-30% of all patients with HCV. Moreover, those infected by HCV genotype 3 tend to develop fibrosis progression more rapidly in comparison with other HCV patients. They also demonstrate a higher occurrence of hepatocellular carcinoma and severe steatosis. Thus, the issue of selecting and utilizing the most effective anti-HCV medications in such individuals is crucial especially at the early stages of the disease. 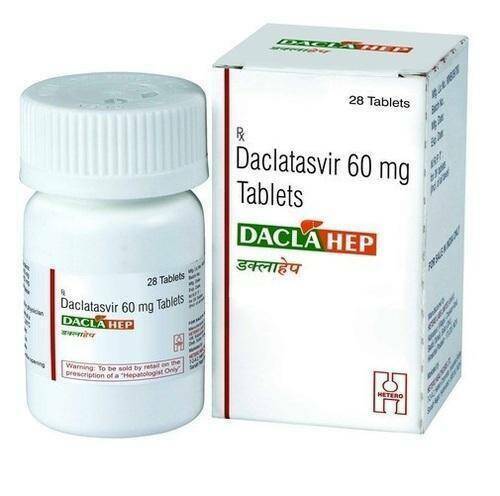 Daklinza is a modern drug with a strong antiviral effect that is widely used to treat HCV infections. The medication works by blocking several crucial nonstructural proteins responsible for the duplication of the virus. The active substance of the medication merges with the active terminus of the said protein (NS5A), preventing it from contributing to the replication of the RNA. The medication is designed especially for treatment of genotype 3 chronic hepatitis C. As of today, it is a mainstream antiviral agent in the currently adopted multifactor therapy. The duration of treatment mainly depends on the genotype of the virus. While the drug is often used for the treatment of either chronic HCV genotype 1 or 3 infections, the provided results may differ in the specific populations despite the administration of equal doses. The drug may lead to the reactivation of hepatitis B in patients considered cured of the virus. Therefore, a specific blood test is required before starting the therapy with this drug. The medication is not intended for solitary therapy. It should be used as a part of a multifactorial therapy with other antiviral medications. The exact treatment regimen is established by the physician with due consideration of all concomitant factors. Liver cirrhosis and/or severe liver disorders may require additional adjustments to the therapeutic schedule. In most cases, the drug is used together with Sovaldi. Certain pharmacological agents tend to reduce the efficacy of its active ingredient. This applies with particular force to the antibiotic Rifampicin. Moderate neurological disorders (headache, weakness, irritability, depression). Individuals taking Rifampicin, antiepileptic agents, glucocorticosteroids of systemic action (in particular, Dexamethasone). It should be taken into account that the medication may cause birth defects. It is necessary to use at least two different complementary methods of contraception during the therapy with the drug. It also increases the concentration of digoxin in the blood, and in conjunction with Amiodarone may lead to the development of symptomatic bradycardia. The active ingredient also affects certain groups of patients on anticoagulants. Daklinza 60 mg combined with Sovaldi is widely used to cure chronic hepatitis C. According to the recent clinical study that involved 152 volunteers with hepatitis C genotype 3 who received a 12-week course of the combined therapy, the said combination provided positive results in more than 87% of clinical cases. The Sovaldi and Daklinza genotype 1 therapy demonstrated a 97% success rate in HCV genotype 3 patients. It demonstrates high therapeutic benefits even in those individuals who have undergone at least one course of antiviral therapy with no noticeable results. More than 86% of patients who had previously undergone an unsuccessful therapy show positive results after the therapy with the combination of these drugs. Nonetheless, it may not be as effective in patients suffering from cirrhosis, (in compliance with the majority of clinical trials, its efficacy is much lower in patients with affected liver). The drug is usually prescribed at a dose of 60 mg orally, in most cases as a part of the concomitant therapy with Sovaldi and/or Ribavirin. A standard course of therapy lasts 12 weeks. If, after the said period, the virus is not detected in the hemolymph, the person is considered cured. In addition, the drug is less expensive in comparison with most traditional antiviral agents. The approximate Daklinza annual cost (including additional agents, such as Sofosbuvir) is less than $80,000 for a standard course of treatment, which takes twelve weeks.